Trampas come up for sale on http://www.powerkiteforum.com with some regularity. Topic: Are E-Boards the future of mountainboarding ? 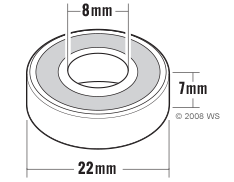 Outer diameter, inner diameter and bearing width. All dimensions should match the bearing that you are replacing. Dirtsurfer comes to mind. No personal experience, but plenty of YouTube vids. Topic: How to find places to ride? Topic: Any rides in the NW United states? Topic: Anybody have any experience with this Ground Industries board? Topic: channel trucks with 15 degree deck?